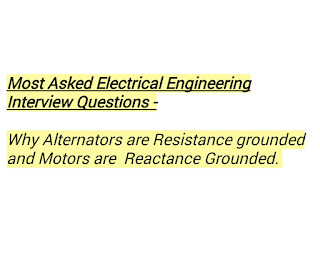 Most favourite questions of any EEE interviewer at any PSUs job is related to Transformer and Machine. Here we are answering most frequently asked interview question related to Alternator. This is basic Questions for Electrical Student. 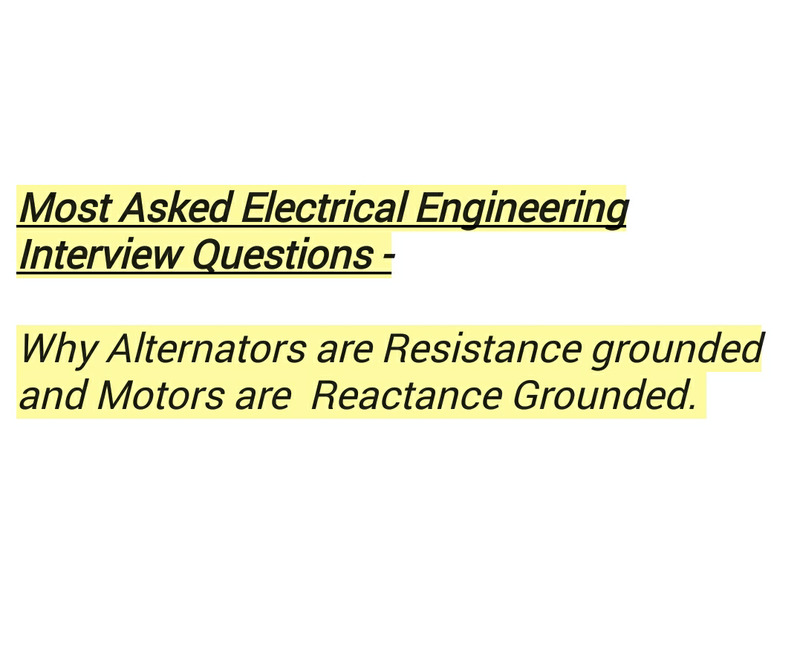 Those who are preparing for Electrical Job, must read Electrical Engineering Interview Questions and Answer from Alternator and Machine his article fully and in careful manner. Why Alternator are Resistance Grounded ?? The value of resistance is usually less than 1 ohm. It is mainly used in alternator during a fault. Accelerating power = Mechanical Power - Electrical Power. So when a fault occur, the electric power decreases and mechanical power remain constant so there is increase in accelerating power of the rotor and it makes the system unstable. As we know that during an unbalanced fault zero sequence current flows through this resistance. So we connect a resistance between ground and neutral terminal because the power losses by this connection in resistance. Power losses means electrical power comes into existence so Accelerating Power decrease so acceleration of rotor is reduced and stability is increased. So, to improve the stability of system we use resistance grounding in Alternator. There is no loss of power under balanced condition bcz no current flow through the neutral and hence this resistance does not affect efficiency of the system. Why Motor are Reactance Grounded ? Over excited synchronous generator worked at leading power factor. So it acts as a capacitor and hence there will be charging currents present in the system. Whenever a Line to Ground LG fault occurs the phase voltage becomes equal to line voltage and can cause Insulator Flash-over also called as "Arcing Fault". To rectify this we try to cancel the capacitive charging currents and for that purpose we use a reactance in neutral. If this reactance completely cancels the capacitive current then it is called as “Resonance Grounding” and the inductor used is called as “Peterson Coil”.